statistical dependence between variables (peak-energy; peakpeak; energy-energy) has also been quantified. Keywords—Partial discharges, UHF measurements, HF measurements, Antennas, IEC60270, Correlation. The paper is open access and can be dowloaded here. Abstract— In the localization of electromagnetic or acoustic emitters, generally, when a pulse is radiated from a source, the wave will arrive to two receivers at different times. One of the advantages of measuring these time differences of arrival or TDOA is that it is not required a common clock as in other localization techniques based on the time of arrival of the pulse to the receiver. With only two sensors, all the possible points in the plane that would give the same TDOA describe a hyperbola. Using an independent third receiver and calculating the intersection of the three hyperbolas will give the position of the source. Therefore, planar localization of emitters using multilateration techniques can be solved at least with three receivers. This paper presents a method to locate sources in a plane with only two receivers reducing the number of acquisition channels and hence, the cost of the equipment. One of the receivers is in a fixed position and the other describes a circumference around the first one. 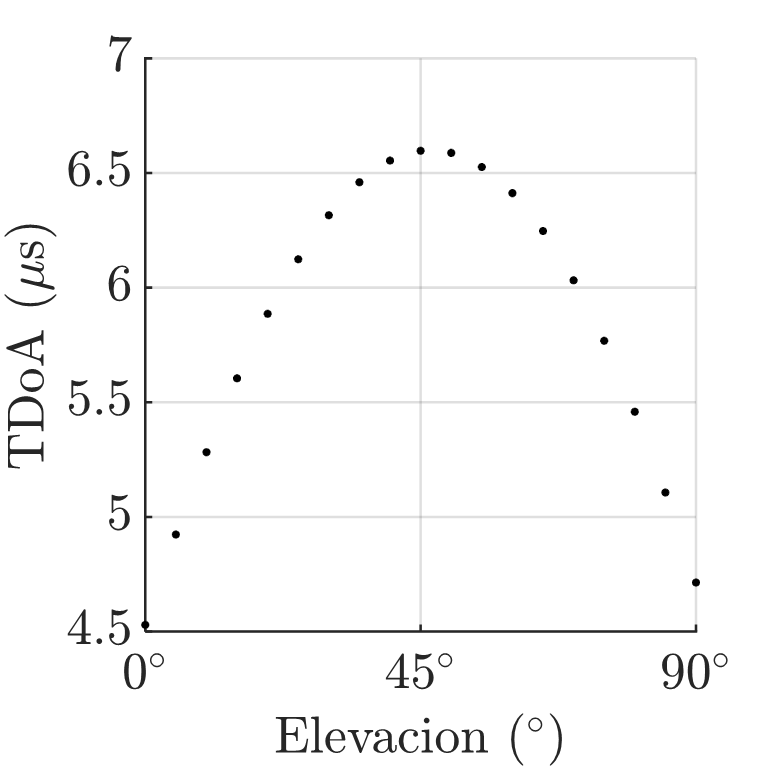 The TDOA are measured at different angles completing a total turn and obtaining a periodic function, angle versus TDOA, that has all the geometric information needed to locate the source. The paper will show how to derive this function analytically with the distance from the fixed receiver to the source and a bearing angle as parameters. Then, it will be demonstrated that it is possible to fit the curve with experimental measurements to obtain the parameters of the position of the source. J. M. Fresno, G. Robles, J. M. Martínez-Tarifa and B. G. Stewart, “A combined algorithm approach for PD location estimation using RF antennas,” 2017 IEEE Electrical Insulation Conference (EIC), Baltimore, MD, USA, 2017, pp. 384-387.
spatial geometry to detect the radiated electromagnet energy from the discharge. 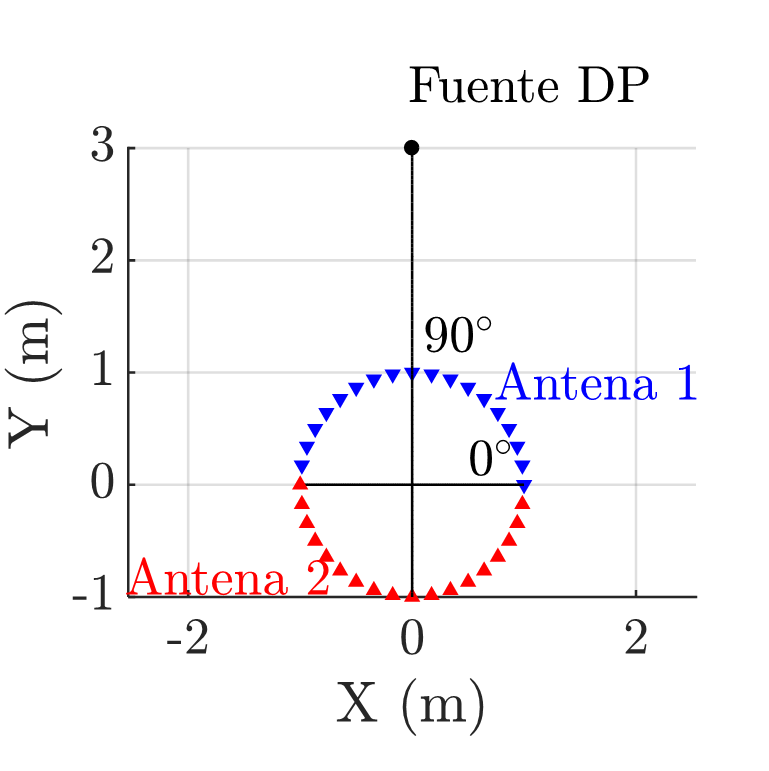 The time-difference-of-arrival (TDOA) between the signals from each antenna are then used within multi-lateration equations to determine the position of the source. The iterative Hyperbolic Least Squares (HLS) method and the non-iterative Maximum Likelihood Estimator (MLE) method are two common techniques used in the literature to solve the multi-lateration equations. This paper investigates the ability of combining MLE and HLS to improve location accuracy and maintain fast location computation time. 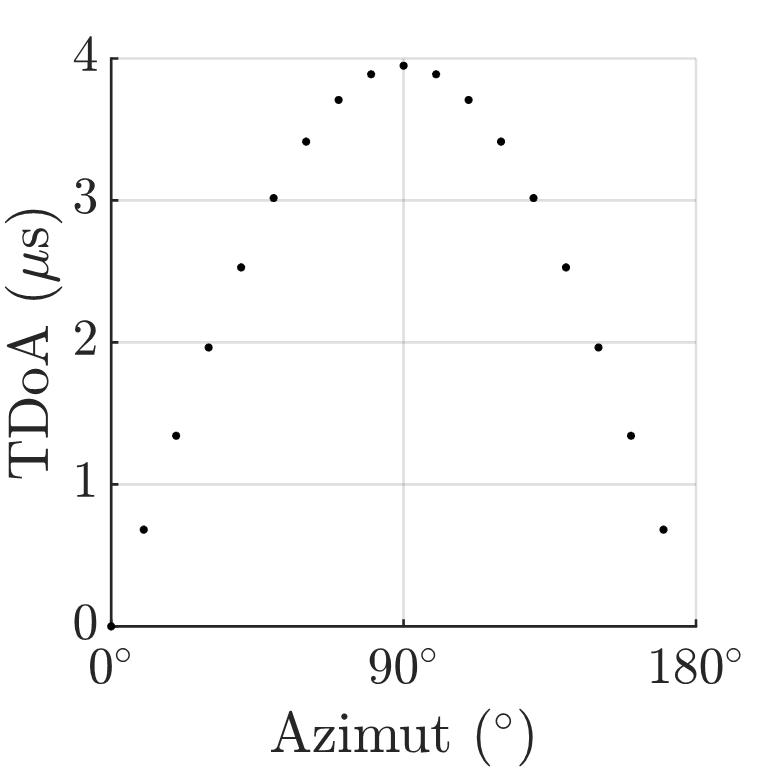 To this end HLS, MLE and the combined MLEHLS method are evaluated in terms of location accuracy and computation performance for three spatial antenna configurations, namely Square, Pyramidal and Trapezoidal arrangements. The location accuracies for each method are evaluated for theoretical TDOA values and also for the case when a finite sampling rate of 10G samples-per-second is considered; the latter is implemented through appropriate rounding up of TDOA values by one sample time. It is shown that MLE-HLS produces improved location accuracy compared with HLS and MLE for both theoretical and finite sampled TDOA values. In addition, it is shown that MLE-HLS improves significantly the computation time over the iterative HLS method. José Manuel Fresno, Guillermo Robles, y Juan Manuel Martínez-Tarifa. E-Mails: jfresno@ing.uc3m.es, grobles@ing.uc3m.es y jmmtarif@ing.uc3m.es. La medida de descargas parciales (DP) permite llevar a cabo un mantenimiento predictivo en instalaciones eléctricas. Las DP emiten una radiación electromagnética que puede ser medida con antenas para la localización de la fuente sin interrumpir el servicio de la instalación. Actualmente, se usan al menos cuatro antenas situadas en distintos puntos para la localización de la fuente de DP. Calculando la diferencia de los tiempos de llegada de la emisión a las antenas, y minimizando la función objetivo F se puede estimar la posición de la fuente de DP. Para calcular la dirección (azimut y elevación) de la fuente de DP se deben orientar las antenas maximizando y tomar datos en varias posiciones. La distancia entre antenas se mantiene contante e igual a 2 m. Como la velocidad de propagación es m/s, el máximo es µs. La posición de la fuente de DP se define como la intersección de las direcciones calculadas en las posiciones donde se realizan las medidas. Sistema de adquisición de señales de dos canales basado en una FPGA con un ADC de bajo coste. Antenas monopolo omnidireccionales adaptadas para medir en la banda de frecuencias de las DP. La nueva metodología permite localizar fuentes de DP con un sistema de adquisición de dos canales en lugar de cuatro. La reducción de canales de adquisición reduce el precio y el peso del sistema de adquisición. Es posible localizar fuentes de DP con un sistema de adquisición de dos canales. Ubicando este equipo y las dos antenas en un vehículo aéreo no tripulado, se podría mejorar la exactitud de las medidas y por tanto de la localización. Abstract—The maintenance of high-voltage equipment is paramount to avoid blackouts or the interruption of electrical service. One of the most reliable methods to know the status of insulation systems is the measurement of partial discharges (PD). This phenomenon occurs when the dielectric presents imperfections due to ageing and degradation processes. Partial discharges are sudden releases of charge that can emit energy in a wide band of frequencies even in UHF. Therefore, antennas can be used, not only to detect the occurrence of PD, but to locate the source of emission and, consequently, the damaged asset. The localization can be done using multilateration measuring the time-differences of arrival (TDOA) of the pulses to an array of antennas. However, the onset of the signal is difficult to define due to numerous issues, from low signal-to-noise ratio, to lack of line-of-sight or errors in the positioning of the antennas. Then, the position of the source may have large uncertainties that even can prevent finding the asset at stake. 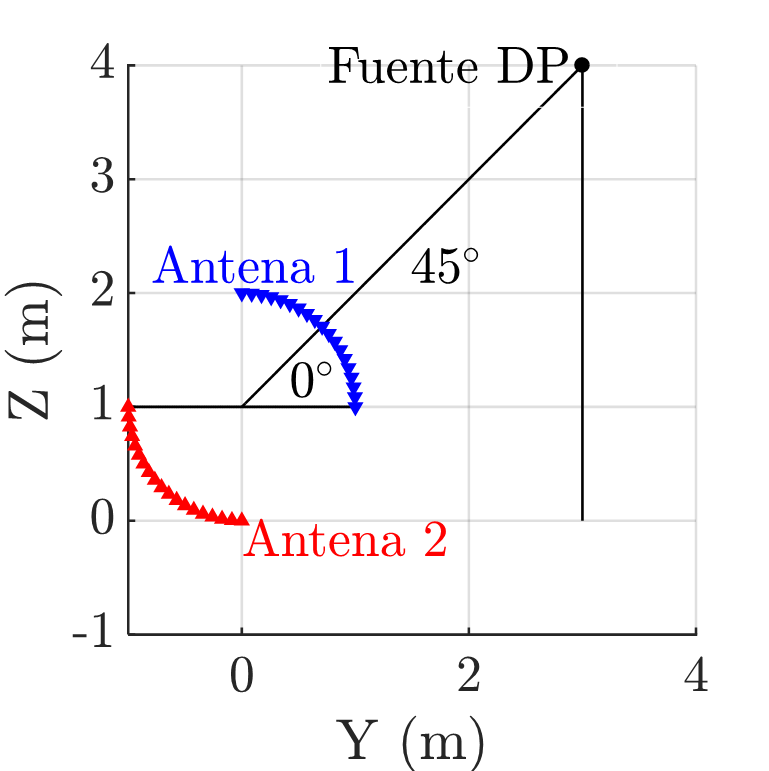 The configuration of the antenna layout can help to minimize the effect of the uncertainties in the measurement of the TDOA. It has been found that there are configurations that favour certain bearings when locating the source giving more accurate results. This paper explores three type of antenna layouts and devises a method to determine what directions are best to orient the array. Keywords—Antennas, Radio-frequency, Localization, Partial Discharges. Abstract—Electrical insulation can have imperfections due to manufacturing or ageing. When the insulation is electrically stressed, discharges may happen in these inhomogeneous imperfect locations resulting in partial discharge (PD) which have very fast rise times and short time durations. Since charges are accelerated within PD activity, radiated electromagnetic energy across a wide bandwidth of frequencies can occur. The measurement of the radiated PD energy is widely employed to identify defective insulation within high voltage equipment. Based on assessment of the strength and nature of the emitted PD signals, determination is made to carry out predictive maintenance in order to prevent equipment breakdown. The location of emitted radiated PD signals may be determined using multi-lateration techniques using an array of at least 4 antennas. Depending on the relative position between the antennas and the PD source, the radiated emissions from the PD source arrive at each antenna at different times. The relative time differences of arrivals (TDOA) together with the antennas position are variables used to locate the PD source in 3D space. The effect on the location error of a PD source using TDOA calculations based on acquisition sample time errors is a topic which has previously been studied (see bibliography). This paper now investigates the accuracy on PD location as a consequence of error on the measured positions of the antennas. This paper evaluates the influence of positional antenna error on the possible accuracy of the localization of the PD source. This error is analyzed for 3 different antenna array layouts and for different vector directions from the arrays. Additionally, the least sensitive layout with regard to positioning errors is proposed to assist in improving the location accuracy of PD sources. Keywords—Radio-Frequency Localization; Partial Discharges; Antennas Positioning; Measurement Error. Abstract—Extracting tiny amounts of energy from non-conventional sources using Peltier cells, piezoelectrics, antennas or inductive probes has become very popular in recent years to power low-consuming sensors in IoT applications and smart grids. These energy harvesting methods rely on the continuous generation of small quantities of electrical energy scavenged from heat, vibration or electromagnetic emissions. This energy is stored in batteries or capacitors reaching low-voltage levels that cannot be used directly to power any device. In general, the voltage is boosted to more appropriate levels with a converter. Using inductive sensors to harvest energy from electrical power lines is common knowledge. Obtaining this energy from high-power low-frequency signals is currently possible and, in some cases, reliable and profitable. The aim of this paper is to evaluate the possibility of harvesting energy from extremely low-power and high-frequency events that occur in electrical assets when the insulation is damaged. These events, called partial discharges, are used in electrical maintenance to detect possible defects in the insulation. Evaluating partial discharge activity is a common protocol in all utilities that requires the use of expensive sensors and acquisition systems, and in most occasions, decommissioning the asset to connect the measuring system. The energy from these phenomena is stored in capacitors and the use of a high-frequency voltage multiplier allows to reach voltages close to 1 V. This voltage is proportional to the number of partial discharges in a certain time span. Therefore, if the number of partial discharges per time-unit has increased noticeably, the insulation has deteriorated and the asset should be decommissioned to evaluate the damages. The paper tests the possibility of using this method as an early-warning system in the maintenance of electrical assets. Keywords—Energy harvesting, maintenance, inductive sensors, high frequency pulses, partial discharges. Abstract—As a result of the use of inverted-fed drives, enameled magnet wires of induction motors are suffering from partial discharge (PD) activity. This is a clear ageing mechanism for the machines which leads to unexpected failures in these systems. Ageing characterization of this insulation system is essential for these applications. In this paper, several statistical PD quantities which account for PD magnitude and repetition rate are studied in ageing processes of twisted pairs of enameled magnet wires. The resulting ageing curves have been adjusted to several mathematical functions in order to check if any clear tendency is detected.